Our home course once again proved to be one of the most difficult to score well on this past weekend. There were a total of 107 players that shot a combined 1,579 over par. 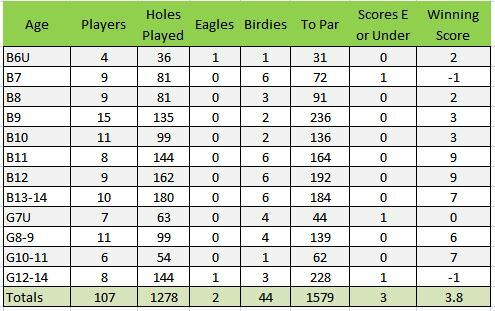 Of the combined 1,278 holes played there were 46 birdies or better and 29 holes with a score of 10. Average winning score was 3.8 over par. ** US Kids played the course as a par 72 but it's actually a par 71. Hole 10 was played as a par 5 on the card but it's really a long par 4 uphill. Of the 92 kids that played the 10th hole there were three 4's and two of those were from Girls 7U. Best I can tell, there were 7 kids that call this course home that shot a combined 74 over (one girl shot -1 and one boy shot +32). Two of the seven won their flights. I feel bad because these scores will drive kids away from playing our course in US Kids competitions but it has been in rotation for almost two years now (5 seasons). The course is short (5,800 from the tips) but is very tight with laterals, barrancas that eat balls, small greens and lots of slope to consider on steep uphill / downhill holes. We call #10 Cardiac Hill because two guys have died walking up that hill. I played the course in the morning before the tournament and told my buddy there wouldn't be more than 3 scores at even or better (nailed it! ).